In my mini-series on National Energy Balances (Balance Energético Nacional, BEN) of countries in South and Central America, I have reached the Plurinational State of Bolivia. I couldn’t find any Sankey diagrams on the website of the Ministerio de Hidrocarburos, which apparently is responsible for drawing up the energy balances for Bolivia. However, I was sure they must exist, as a press release for the launch event of the report exists. Finally I found a publication of the ministry for 2000-2009 in the BIVICA library and it has some black/white energy flow diagrams. There have been newer editions of the report until at least 2015, and here is the BEN Bolivia for 2014 (from the OLADE library), You might remember that OLADE, the inter-governmental Organización Latinoamericana de Energía plays an important role in motivating countries to draw up their BEN and runs a website where BENs are available for many Latin American countries). The unit of flows is ‘kbep’ (kilo barrels of oil equivalents / miles de barriles equivalentes de petróleo). 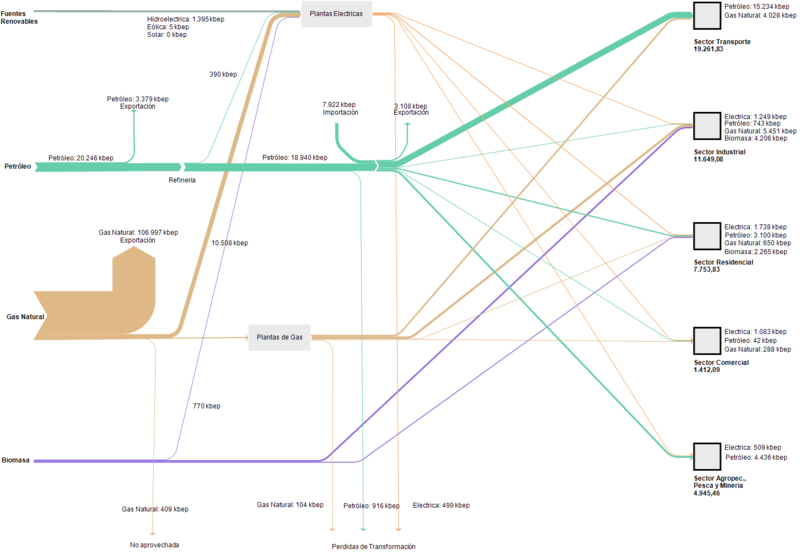 Now, this Sankey diagram is definitely not to scale: the width of the flow representing 133,902 kbep of gas would have to be almost 6 times wider than the one standing for 23,065 kbep of petroleum. The biomass flow would have to be much thinner in comparison, hence it is over emphasized in the diagram for the reader who is unaware. My feeling is that the person who did this wasn’t acting with bad intentions, but had no technical means or support to do this properly and just glued it together from round rectangles, arrows and other shapes. Definitely a candidate for a remake, if I find the time… Edit: I found some time to remake this BEN for Bolivia with flows being to scale. Quite a difference to the above! It becomes obvious, that the country is primarily a natural gas exporter. I didn’t notice this dominance of energy export at first. Now with the flows being to scale, the details and differences of the other flows are hard to tell. One would have to remove the natural gas export to show more of the domestic energy flows. An analysis of the BEN Bolivia and some background on the data is available (in Spanish) in this paper.